I’ve decided that I want to blog more often, so I’ve signed up to The Daily Post, to use their daily inspiration for some posts. Today’s inspiration is a question: What are the three countries you’d like to visit and why? England is my first choice of where I’d like to go. First of all to see my heritage – my mum was born in Liverpool. But there’s plenty more in England that I’d love to see. I’d love to attend a Manchester United football match at Old Trafford. I’d love to see a county cricket match. I’d love to attend an Ashes test at Lords (even though Australia isn’t going all that well at the moment). 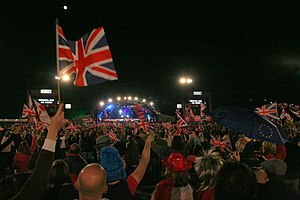 But the thing I’d love to do the most (and did seriously consider at one stage) would be to take two months off, and visit England during the Proms. Just stay in a backpackers for the two months, and head off to a prom each night for two months (and hopefully get in for the last night of the proms). It would be such an incredible experience. There’s lots of stuff that I don’t like about the USA, but there’s still lots of things that I’d love to see. The sports, for one thing, is incredible. I’d love to see a Los Angeles Lakers match, an NFL match (Chargers are my team, but I don’t follow closely) and I’d like to see a baseball match live. Music in the US is also incredible. One thing that I would like to do is to go to a College Football match to view the marching bands. This morning I watched the Edinburgh Tatoo, and now I’m watching the Rose Parade. The thing that I think makes the US marching bands incredible is their percussion section, the drum line. But the music doesn’t just stop there – many of the greatest orchestras are in the US. I’d love to see the New York Philharmonic and Boston Philharmonic, amongst others. There’s also a number of people who I’ve met online through Violinist.com that I’d love to meet in person. I know I’m kinda cheating here, in that Europe is more than one country, but this is the third trip I’d love to do. I’d like to visit Germany, Austria, Italy and France to visit all the places where my favourite composers lived. And again, hearing the other great orchestras of Europe – such as Berlin Philharmonic and Vienna Philharmonic. And if I got to go skiing in the Alps, well that would just be a bonus. So that’s it, that’s my first Daily Post, and I’m looking forward to seeing what else gets suggested. Hope you enjoyed. Wouldn’t it be great to get the chance to go to all these places? But what about Italy? All that art and all that music history! I did include Italy in Europe! There’s just too many places I want to go! Next Next post: Who deserves more credit?